For more technical solutions visit the Colnatec support database. Why do I receive “No Crystal”, “-2”, or ”-3” for the crystal frequency? If the term “No Crystal” is shown in the software’s status screen, the graph screen shows a “-3” or “-2”, or the RS232 communication is reporting a -2 or -3 from the unit is indication that the EON unit is not receiving a signal from the crystal of the sensor head. This issue is generally due to a hardware issue, and generally not related to the software. What does a quartz crystal’s resonant frequency refer to? Resonant frequency is the starting frequency of the crystal, occurring at the beginning of a measurement cycle. To determine Delta F, for instance, you take subzero minus the final frequency of the crystal after coating. How do I calculate the piezoelectrically active area on the QCM (area between electrodes)? The area can be calculated using Pi times the radius squared. Measure the electrode diameter, divide by 2, square, and then multiply by 3.14159. This is the smallest coated diameter of the crystal (area of the circular pattern on the back of the crystal). What is the density of quartz crystal? Does Eon™ software feature a compensation logic for temperature vs frequency for a fixed process temperature? If so, how does it handle different materials? When running a fixed temperature deposition there should be little to no change in the frequency of the crystal. Specific crystal cuts are more stable at specific temperatures. Depending on the temperature of the deposition, using a specified cut of crystal for a specific temperature range is recommended. Using the correct crystal will significantly reduce fluctuations at the specified deposition temperature. Click here to see different crystal cuts for specified temperature ranges. Is the Phoenix™ sensor designed to be water or air-cooled? Phoenix™ employs a thermocouple to monitor the temperature of the sensor head during deposition. Monitoring temperature in this context contributes to deposition accuracy because temperature fluctuations during a process will have a detrimental influence on stability. Additionally, monitoring temperature has the added benefit of ensuring that any cooling system being used in the process is functioning correctly. Why does Phoenix™ provide a temperature monitoring function? The Phoenix™ employs a thermocouple to monitor the temperature of the sensor head during deposition. Monitoring temperature in this context contributes to deposition accuracy because temperature fluctuations during a process will have a detrimental influence on stability. Additionally, monitoring temperature has the added benefit of ensuring that any cooling system being used in the process is functioning correctly. If the AT crystal is stable at 100°C or 150°C, why is water-cooling needed? Quartz crystals expand when heated, influencing frequency. When the temperature is regulated, stability increases. Temperature fluctuations will have a reduced affect on stability when temperature remains within the crystal’s operating range. When process temperature closely matches the crystal’s minimum operating temperature, stability and accuracy increase due to minimal shifts in the crystal’s frequency vs. temperature curve. 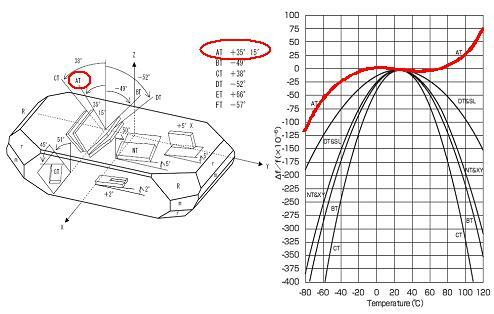 The frequency vs temperature curve for the AT cut crystal is at about 25°C (depending on the cut). Using the correct crystal cut for the specified temperature, along with maintaining the temperature with cooling at that specific point, increases the accuracy of the readings. As long as temperature is maintained within its specified range, the AT crystal has very little change in frequency due to temperature. This means that if the temperature shifts several degrees, frequency change at this temperature is reduced due to its FvsT curve. If, however, the temperature is regulated and consistent throughout the deposition, frequency due to temperature remains unchanged and the readings are extremely accurate at any temperature within the crystal’s operating range. Click here to view the way the curve affects AT crystal frequency. The graph illustrates that at approximately 25°C, the AT crystal’s frequency experiences less drifting due to changes in temperature. If, however, the temperature of the sensor remains unchanged during the deposition, the crystal frequency will also remain unchanged, causing increased accuracy for thickness readings. In short, the more stable the temperature, the more accurate the readings. Can TC1 or TC2 be used to monitor the temperature of the sources? TC1 and TC2 can be used to measure the temperature of any connected K-Type thermocouple. The temperature of the Tempe™ sensor is regulated through TC1, so TC1 would be unavailable for general temperature monitoring while the sensor’s temperature regulation system is in use. Even when TC1 is being used by Tempe™, TC2 can still be used to read any K-type sensor head. Does the DB15 connect to the RTD on the Phoenix™ or Tempe™ head? As part of an earlier product design, the DB15 connected to an RTD sensor inside of the sensor head. Following a redesign, Colnatec products no longer employ an RTD. The new thermocouple design has contributed to achieving much greater accuracy. With a K-Type thermocouple, Colnatec sensors can regulate the actual temperature of the sensor body to +/- 1 degree°C. Colnatec sensors still use a DB15, which is now equipped with a branching cable that connects to TC1 for temperature regulation. What are the power requirements for Eon™ controller? Eon™ controller currently requires a power supply rated for 100-240V AC @ 50/60Hz. For those requiring a power supply other than 110 AC or 240AC, Colnatec may be able provide an alternate power supply that fits a specific application. Colnatec uses a specific type of power supply that provides a full AC ground, allowing for accurate readings with the Eon™. What is the maximum length of the cable attaching the sensor and Eon™ controller? The maximum length is 36 inches from the crystal itself (not from flange; see diagram). An external oscillator can be used to extend this length up to 60 feet. However, the length of the cable between the crystal of the sensor head and the oscillator must be 36 inches or fewer. What type of computer interface is used by Eon™ and Eon-LT™? The Eon™ device itself uses a DB9 port to transmit RS232 communication. A USB adapter is used to convert the RS232 signal to USB. A USB-to-RS232 converter can be supplied on request. What is the difference between Eon-ID™ series and Eon/Eon-LT™ series of products? The primary difference is that the Eon™ and Eon-LT™ require a computer to operate them; Eon-ID™ does not. Eon-ID™ contains an internal CPU and touchscreen, making it also rackmountable. With Eon-ID™, log files can be saved to a external USB drive and viewed on a standard computer. The Eon™ and Eon-LT™ use RS232 to communicate to an external device. Can the Eon-ID™, Eon™, or Eon-LT™ series control both the Phoenix™ and Tempe™ sensors? Eon-ID™ is designed to control Phoenix™, and Eon-LT™ is designed to monitor Phoenix™. Eon™ and Eon-ID-H™ are designed to monitor and/or control Tempe™ as well as utilize the Tempe™ temperature control system. Why does the heater in my Tempe™ sensor overshoot the desired temperature? Heater-overshoot may be caused by a delay between the response of the temperature of the sensor body and the PID controlling the heater. The PID is controlling the heater to heat up the sensor head; however, the temperature of the head requires time to respond. PID settings can be adjusted to minimize this overshoot. A fitting example is using an electric stove to heat a pot of water. The stove can be turned to its highest heat setting but time is still required for the water in the pot to match the temperature of the heating coils. Once the water in the pot reaches the desired temperature and if the stove is suddenly shut off, the pot of water continues to absorb heat from the heating coils on the stove and continues to rise in temperature, before it begins cooling. This is a common issue with regulating heaters with digital controllers. The stove and water pot scenario is the same effect that is occurring in the sensor head. Generally once the heater reaches the correct temperature, the PID can effectively maintain the temperature of the head. Further, environment can also influence how sensor reacts to the heater. Various environments - e.g., vacuum, radiation, etc. - can cause unpredictable behavior. This is why Colnatec offers the user the ability to tune the heater to specific environments. 1) Reducing the P parameter: The Proportional (P) parameter in the PID controller determines how quickly Eon™ makes adjustments to the heater to compensate for changes in sensor head temperature. Using a higher P value for the PID causes the heater to increase or decrease its temperature more quickly, and can increase overshoot. Reducing this value helps reduce heater reaction time - increasing the time required for the sensor head to react and reducing overshoot. It should be noted that this approach will increase the time required by the heater to reach the predetermined temperature. 2) The max power setting [%]: To determine the max power of the heater, a quick, one-time test can be performed in the same environment where deposition is to occur. In Eon™ software, enter "Manual Mode". Select "Heater" from the yellow drop-down menu. Increase the power percentage in increments, and allow the heater to stabilize for 3-5 minute each increment. Do this until you reach your desired temperature set point and record the power percentage being applied. Also, instead of starting a 0%, activate the heater and record the %power of the heater when the temperature becomes stable or close to stable. Otherwise, use a general starting point such as 15-20% depending on the set point temperature. Eon automatically logs the temperature and the power being applied to the heater in the "...\Public Documents\EON_LOGS\HEATER" folder. As an alternative to finding the logs manually, click the "Open Log Folder" button in the "Settings Screen" in the "General Tab" and open the heater folder. Once a power that allows the heater to reach the specified temperature is achieved, set this as "Max Power" value in Heater Settings. This prevents the heater PID from applying more power than that value. Increase the temperature 5-15 degrees to compensate for any cooling effects that might occur in the chamber. Remember, although preventing overshoot and stabilizing the heater, these adjustments will increase the time it takes for the heater to achieve a preset temperature. 3) Soak 2 Power [%]/ Soak 2 Time [s]: If the above change does not achieve your desired results, you can adjust the "Soak 2 Power" and "Soak 2 Time" once the target power is known by the prior test. However, I suggest doing the previous first before applying this setting. Pre-deposition power, specifies that you want the heater to reach a specific amount of power, for the specified amount of time, before it goes into PID mode (To maintain its temperature) this process happens before the heater enters PID mode, so you can set a higher Power level during this period of time to increase the speed at which the heater gets to the set point, then it will go into PID mode and regulate the temperature for the set point. However, setting Soak 2 Power to a power percentage too high, will also cause overshoot. However, this should be a onetime occurrence when the heater is activated, then the PID should activate and regulate the temperature. When the heater is activated, at what power percentage does it begin? By design the heater power starts at 0% and then slowly climbs to the specified temperature. What parameters can be used as a starting point? If the Mirage tends to constantly turn on, reduce the Max Power [%] setting by intervals of 1%. If the temperature is not reached, increase the Max Power [%] by intervals of 1%. If the temperature “dips” too much, increase the Proportional by increments of 100. Will the QCM crystal break when it is subjected to fast temperature gradients? Crystal integrity can be influenced by rapid temperature changes, just as thermal shock can have an adverse effect on the longevity of the crystal. Can a quartz crystal sensor provide meaningful data at -196°C? A Colnatec quartz crystal sensor is designed to operate in temperatures of +20°C to +500°C. The thermocouple connections will be unable to accurately read temperatures outside this range. But the crystal and other components can withstand temperatures below 20°C, theoretically down to -200°C. Also, using a specially cut crystal, the sensor would also be able to read frequencies at these temperatures. Please contact Colnatec Support for more information. Why does a “.7 firmware out of date $@,!177″ error appear when starting Eon™ software? What you are seeing is due to an issue with the computer you are using. The COM port you selected is not connected to the Eon™ device. Windows has an issue where it will sometimes leave the COM ports open, and then echo commands sent to it. This can also happen if there is an abrupt interruption to the COM port, or the COM port gets improperly disconnected. Windows will leave the COM port open, making it appear as though the Eon™ device is still connected to that COM port, when in fact it is not. The COM port selected in the software is echoing commands back to the software causing the software to think it is communicating with the device, when in fact the software is just seeing commands being echoed back to itself on that COM port. This behavior is very similar to how the Eon™ device works. The software is tricked into thinking the Eon™ is responding back, but in actuality is just seeing echoes. This is why the software says that the “firmware” is out of date; it is reading a command being echoed back to the software by the chosen COM port. This is a bug that has been resolved in the new software we are working on. In order to fix this issue, locate the EON INI file in the Public Documents folder with the word “Settings" in its file name. Delete the file. Once the file is deleted, restart the Eon™ software. The Eon™ software will ask for a new COM port. Enter the new COM port and begin using software as usual. Note: This action will restore Settings to factory default. Contact Colnatec Support for the latest Eon™ software releases.